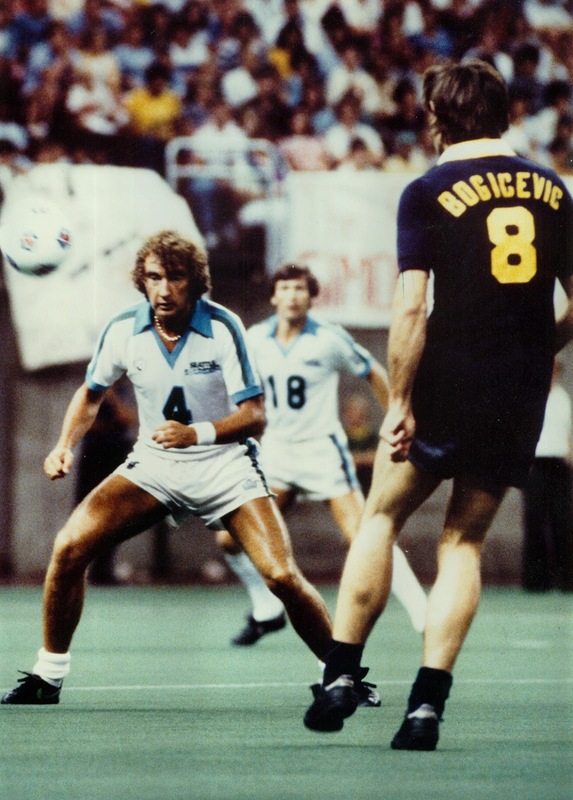 John Best was a player, a coach and a General Manager in the North American Soccer League. After coming over from his native England in the early 1960s, he turned out for the Philadelphia Ukrainians in the American Soccer League (1962-67), the Philadelphia Spartans (1967), the Cleveland Stokers (1968), and the Dallas Tornado (1969-73). He then coached the Seattle Sounders for three years before becoming GM at the Vancouver Whitecaps. He then returned to the Sounders, also as GM. John very sadly passed away a year ago. 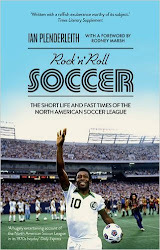 With the permission of his wife, Claudia, here are the highlights of an interview that John gave me in January 2014 while I was researching Rock n Roll Soccer. RnRS: You started out with the Philadelphia Spartans in the National Professional Soccer League [which one year later merged with the United Soccer Association to become the NASL]. Can you tell me about the pay and conditions as a player in 1967? Were you well looked after? John Best: Oh yes, very much so. The pay wasn’t great at that point in time, but it was as good as a lot of people were getting in the first and second divisions in England. I’m sure there were many [in the NPSL] who earned less, but in terms of being taken care of - it was really unbelievable because of the quality of hotels and travel. We flew to games, stayed in the best hotels, and I remember after we played in St. Louis, [team owner] Art Rooney took the whole team out to eat. I don’t know that every team was treated that way, but certainly we were. And at the clubs I later managed we tried to maintain the high standards as well. It was a better experience than most people had in British soccer. RnRS: Art Rooney was typical of the early NASL owner - a wealthy entrepreneur. Looking back, is it surprising to you that people like him wanted to get involved in soccer? JB: Rooney owned the Pittsburgh Steelers. 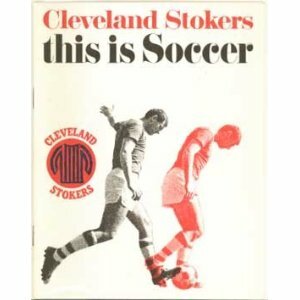 If you go back and look at the ownership of the NASL clubs all the way through that early period, you’ll find that it was extremely strong, and made up mainly of sports entrepreneurs. They were wealthy people, but very shrewd in terms of marketing professional sports. The problem was that the sport was unknown – you’re not just starting up a new sport, but you’re starting up with people with absolutely no concept or idea of that. It took a tremendous effort to grow the sport in those early years. I was very fortunate to play for the Rooneys. Later on I played in Dallas for Lamar Hunt, and then went up to Seattle as coach for an expansion team, where the ownership group were city elders, and [were] just very intelligent, proactive people. So you had a great opportunity to do a quality job, because you were left alone to do it, and with enough funding. I’m not suggesting that all ownerships were like that. There were amazing changes as time went by, and the majority of teams became corporately owned, and that brings a difference in attitude and perspective – when you have a meeting of CEOs of major corporations compared with a group of wealthy sports entrepreneurs. RnRS: The Spartans folded after one year. Was that down to money? JB: That was part of the reason, but they also had the licence for horse racing in Philadelphia – that was certainly profitable. They were offered the licence for through-bred racing, so they took that instead of soccer, and I think they used the same facility for the horse-racing. RnRS: Then in 1968 you went to Cleveland, but they only lasted one year as well. JB: It turned out that 80-90% of the Spartans were going to Cleveland, so I wanted to be part of that. They were owned by two groups, I believe – one was baseball, the other politicians. We played in the huge Civic Stadium down by the lake there, we had some good games. [Crowds were] not necessarily that impressive [the Stokers pulled in 4,000-6,000 at home games - RnRS], and it never seemed to really catch fire. We played in the conference final against Atlanta and lost there, so they decided they’d lost too much money and didn’t want to continue. But also around that time the league had lost its network TV contract. Although those contracts weren’t necessarily providing huge amounts of funds – they weren’t – the League had been based on network contracts for long term major revenues, so any time they lost coverage it would drop down for the league and they would lose teams. That in my opinion was the major problem with Cleveland. RnRS: At least in Dallas you managed a few years in the same place. RnRS: He seemed like a tireless worker at getting new owners into the League. Was the 1974 expansion all down to Woosnam's powers of persuasion? JB: No. I mean, I think that’s a large part of it, but I think there was true expansion in attendance, in general coverage, and a presence of professional soccer. You have to remember that the players by then had gone out and made many, many appearances both as individual players and as whole teams. In Dallas, as I’d done in many cities, we were trying to get into the schools. We were introducing some completely alien sport to people there. When I first arrived, the immigration official at the airport checking my passport said, "You guys are great on skates." I thought, "We’ve got a job to do here." We went around to schools, and we’d either take PE classes for the day, or put on an assembly in the evening after school or during school hours. And so we could put on demonstrations - ball skills, small-sided games, it was fantastic. Our goal was to create teams from those assemblies just by grouping young students, more by physical looks than anything else, and then finding parents willing to supervise them. Then you had to work hard to keep the parents ahead of the kids in terms of skills and coaching, so the parents had a crash course in learning about the game. I think when I first went there [in 1969] there were a couple of hundred kids registered to play soccer in the whole of Texas. And of course today there are hundreds of thousands. The hard part of that - and to some degree that’s still true today - is how do you transfer that interest into a paying customer, and I think there’s been varied success in that respect. Here in the Pacific North West there’s been tremendous success with that, and the past players deserve some credit for the success of the game. At that time there wasn’t another professional sport doing the same, certainly not on that scale. I think you got a different image of the players, they had a different relationship with the fans, and I think that remains today. To me, that really is the major foundation point of what is professional soccer [in North America] today. And I feel fortunate to have been involved with that. RnRS: How did your move to Seattle in 1974 come about, and what was the secret to Seattle’s quick growth after that? JB: For some time before Seattle I’d been trying to decide where my future path was going to take me. I eventually decided I wanted to be a General Manager, and the way I was going to get there was to become a coach and get some experience as a head coach – it’s one of the most difficult man management tasks you can be asked to perform. I was fortunate to be Ron’s assistant for a number of years. I’d played the game, knew the game, had recruited players to Dallas, I’d worked with the youth programmes and the colleges, so I had a good background. I was fortunate that expansion came about in 1974 – I had interviews in Philadelphia, LA and Seattle, and I felt the ownership group in Seattle was outstanding. The managing general partner was Walter Daggatt, head of Skinner Corporation. They offered me a contract and I took it. A guy named Hal Childs was the PR director, he had worked in pro sports – basketball and baseball – for many years and he knew everybody in the sports media world. He was a smart guy, and so we set out to do it, had a great time doing it, worked our butts off. I was out all the time, almost every night, especially if I didn’t speak at lunch-time. And we’d basically tell everyone the story of soccer, tell them to come out and give it a try. In Vancouver we did the same programme, but there we also had ambassadors – we were more advanced by that stage. We had bigger crowds at the outset, so we were able to get some avid supporters to become ambassadors, they would put together groups and were quite influential in terms of sales programmes. 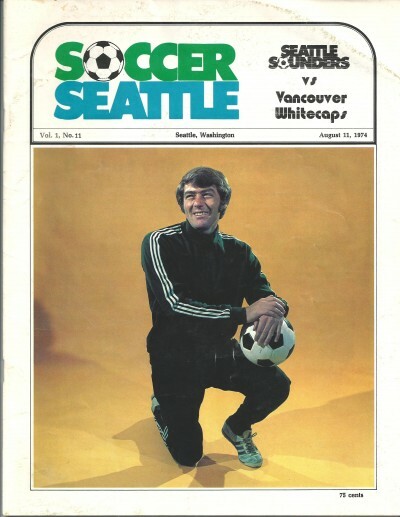 RnRS: What was it like coaching the bigger names in '76 that came to Seattle from England, like Geoff Hurst and Harry Redknapp, who maybe thought they were a little bit above playing in the NASL? JB: All those things are true, but I did not have a problem with this. You see those types of issues over here – certainly I did. But in terms of play, they’re all personalities, like the two you mentioned – Hurst, Redknapp and let’s add [former Everton and Scotland midfielder] Jimmy Gabriel. In 1976 he was the ideal person to bring in as a player and have him involved in coaching. He wanted to coach, he was at the end of his playing career, and so this was a great opportunity for him. In Vancouver we’d go after players while growing the team, so we’d acquire veteran players when the time was right. We also brought in younger players who had ambitions to play in the English first division or wherever, and we would hope to make some money by investing in them. I think the player side of it is something that soccer in North America has struggled with because it’s difficult to assess players… you know you’re going to make some mistakes whether you’re good at assessing it or not. RnRS: You returned to Seattle around the time of the Bruce Anderson ownership when things were going downhill for the club. What’s the story behind the decline? JB: I think the timing of what you say is right. The owners prior to Bruce Anderson were the Coluccio brothers - engineering contractors. They didn’t have a good knowledge of the game, and unfortunately didn’t put together the greatest front office. They got into trouble at that time in terms of cash flow, and so they said they were getting out. I can’t recall who it was, but it might have been Alan [Hinton - Sounders coach, 1980-82] who came across Bruce Anderson - he was an ex-NFL player who worked in the stock market. He ended up with a controlling interest, but he wasn’t well funded. He did have a partner who really put a different light on the operation – his name was Jerry Horn, a very successful businessman in Seattle. So when you looked at the ownership and saw Jerry Horn there, you reacted quite differently, and that influenced a lot of people. But then Jerry moved on, and so the club became even more unstable. Attendances were remarkably low – I remember a game sitting in the stands with my wife and there were 5 or 6,000 in a 60,000-seat stadium, and we were accustomed to attendances in excess of 20,000. It’s very difficult when you get to that stage to re-ignite the flame. It’s very hard… a lot of people still loved the game and the team, but they didn’t attend games. You had to find ways of resolving the divorce, really. We did some things towards that, things that reminded me of the early days with the Sounders. It might have been the first year – we did not make the playoffs despite having more points than two teams who did. Anyway, we’d had a great season, the fans had been unbelievable. As the players ran out each was given a bunch of roses and were told to go up in the stands and give one to the first woman they could see, and thank the woman for the season and her support. That made an unbelievable impact, and our mail sacks were crammed full of letters afterwards. Without sounding too corny, I hope, that was an experience of feeling that went far beyond sport. I was talking earlier about contact from people to people. That was one of the basic building blocks as well. RnRS: That connected you with the fans, yet when the team went downhill, Bruce Anderson’s firing of Alan Hinton seemed to have the opposite effect. JB: I really don’t want to go into that. Clearly Bruce Anderson was not a good owner. His rationale for doing things was not always right. I would not say that was the reason why the club folded or declined – it was already in a precarious situation from the previous ownership group and operators who’d put the club into a very difficult situation. So really I don’t think subsequent decisions were responsible for the ultimate demise. I think the city still sees the Sounders with an image from their time in the 70s – I have people coming up to me and saying, I remember when I was a kid and my dad would take me to the game. They still have those positive memories. It was a special time in my life and I’m fortunate that I was involved at that time. RnRS: [England international and ex-Chelsea player] Alan Hudson loved his time in Seattle, but left under a cloud after the new ownership. Do you recall that? JB: I remember Alan coming here, of course, and as a player throughout his career, a fantastic player. I saw him play for England at Wembley – he was never a player with flourishes, he was never an extrovert in his play, but he’d never give the ball away. Maybe Beckenbauer could do that, but he played in deeper positions and so he had more time and space, but Alan Hudson used to do that in very tight areas. Having said all that, I don’t think his style of play was necessarily appreciated at that time. People who understood the game did appreciate him. His style of play wasn’t to get at them, but it was a possession game. When you have a talent like his, you can do whatever you want with the ball. RnRS: [Vancouver Whitecaps President] Bob Lenarduzzi says the legacy of the NASL is in the PNW. You could argue that it’s rescued Major League Soccer. JB: We had that argument a long time ago – do you put money into the teams that are proving a great success, or do you invest money in the teams that aren’t doing as well to maintain a league? Clearly you have to encourage the teams that are succeeding, and hope that the teams not doing so well can resolve their issues. Some markets are so different from Seattle and Vancouver that I don’t think they’ll have that level of success in my lifetime. I hope they do. I think people in the North-West have seen the success of professional soccer, and that’s really the legacy of the sport. That doesn’t mean it’s guaranteed, and that you’ll retain those fans – you have to have an attractive team and a sensible business plan. But I think the North-West is a great story for professional soccer.